A hilarious pseudo-history of marketing management, which explicitly denies resemblance to any actual history, and which will be horrified if some semblance be found. The story of a man who discovered that the path of life is strewn with treadmills and, if you get on one by mistake, you could keep running all your life to stay in the same place. The story of how a businessman may just be minding his…err…business and the ‘Invisible Hand’ can cause unexpected consequences to arise out of his innocent actions. There is no point blaming the tale for being exaggerated because that is precisely what it seeks to be – an ‘exaggeratio ad absurdum’ of some facets of the world. Anything you learn from the book – be it the basics of marketing management or a satirical view of Society – you do at your own risk. Spike Fortune who only sought to feed dogs and, later, sought more dogs to feed. 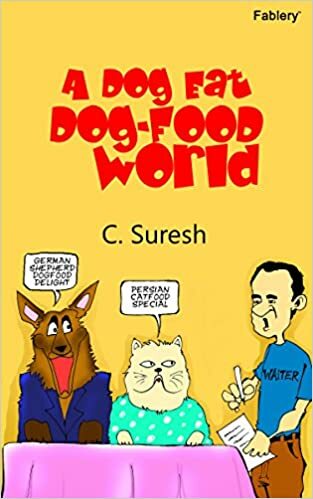 Jerry Fortune who, being fortuneless, gets dragged helter-skelter behind his uncle Spike in the latter’s careening pursuit of commercial success and gets sandwiched between Spike and..
Tyke who was Spike’s resident genius on enticing dogs with their wares. He also has to help Spike in his rivalry with..
Tom Rich, who is unwillingly dragged into upstaging Spike and tries to do it by teasing the palates of cats, helped by the bumbling efforts of..
Jasper Rich who would rather be partying than chasing cats with cat-foods. Spike Fortune, who, being unable to justify his existence by making money, is obsessed with justifying his existence by spending all his inherited wealth. Lead into the paths of commerce, he discovers that, while it may seem attractive to set out to lose money, the natural consequence of having people consider him a loser was indigestible. Having set out to feed dogs, Spike becomes obsessed with feeding more dogs and, later, having more dogs to feed. Jerry Fortune, who discovers that there are perils to having your livelihood depend on a benevolent uncle. Tied to his uncle’s coat-tails by a need for sustenance, he is dragged helter-skelter behind Spike in the latter’s careening progress in pursuit of commercial success. Having first been a mere interpreter between his uncle, Spike, and the resident marketing guru, Tyke, he later finds that being in the middle can get very uncomfortable, indeed. Tom Rich, who had never realized that the easy contempt he had for his schoolboy acquaintance could prove so dangerous. Spike’s meteoric rise in the world of Commerce puts him in a position of either having to prove himself better or have all that contempt come back with usurious interest. He drags his nephew, Jasper, along in pursuit of teasing the palates of cats. All that Spike and Tom had wanted was to be a winner in their respective businesses and, more importantly, in their own private game of one-upmanship. They had no idea that their humble quest would redraw the contours of Society and set in place principles that both businessmen and Society would live by. Fiction has been an addiction but the need to make a living took Suresh through Chemical Engineering and a PGDM at IIM-Bangalore and, from thence, to a long 16 year stint in the area of finance with specific expertise in fertilizer subsidies and a further two years as consulting expert in the same area. That, in his words, about sums up the boring part of his life, except for the people he was privileged to meet. Otherwise, he can be described as a mess of contradictions – a bookworm but avid trekker; alone but never lonely; enjoys solitude but loves company; lazy but a perfectionist, the litany is endless. Trekking, which side-tracked him from the writing for which he quit his job, is a major passion and he does, at least, one trek in the Himalayas every year in addition to numerous local treks. He reignited his passion for writing with a fairly popular blog www.jambudweepam.blogspot.in. The blog has been rated among the Top 5 humour blogs in India, twice in succession - in 2014 and 2015 - by BlogAdda, and has also been listed third among the Top Humour Blogs by Baggout.